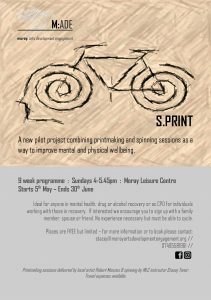 This new pilot project from M:ADE – Moray: Arts Development Engagement, combines printmaking and spinning – on a stationary cycle- in seperate sessions over nine weeks, on Sundays from 4:00 to 5:45pm. This creative and unique combination has been designed for anyone in metal health, drug or alcohol recovery, or for those working in recoveries. The printmaking sessions are delivered by Robert Menzies, a local artist, and spinning by MLC instructor, Stacey Toner. Further information, and how to book, can be seen on the brochure below.